The iconic event celebrates Greek culture through traditional dance, crafts, and—of course—loukoumades. The 67th annual Portland Greek Festival invites you out to the Holy Trinity Greek Orthodox Cathedral to celebrate all things Greek. 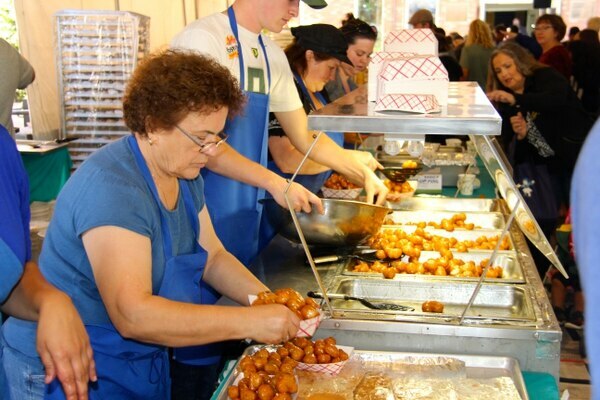 The October 5 – 7 event is an opportunity to experience culture by way of traditional folk dance and musical performances, browse goods from craft and jewelry vendors, and—of course—indulge in all the loukoumades your heart desires. Now in its 67th year, the Portland Greek Festival has evolved to one of the largest festivals of its kind. After moving to a larger church on 32nd and NE Glisan in 1952, church members began hosting a bazaar featuring their handwork, food, pastries, music and dances from their homeland… initially as a way to pay off the church mortgage. This was the beginning of what is now known as the Portland Greek Festival. After six decades, the Greek Festival has become a major celebration of the Greek Orthodox faith and rich culture, complete with a Hellenic-American Cultural Center & Museum, shared with over 15,000 guests annually. An iconic event, it has been designated as an Oregon Heritage Tradition. Each year a portion of proceeds go towards worthy local philanthropic endeavors – like blankets for the homeless, Make-A-Wish Oregon, St. Francis Dining Hall, Sunshine Division Pantry, and many more. 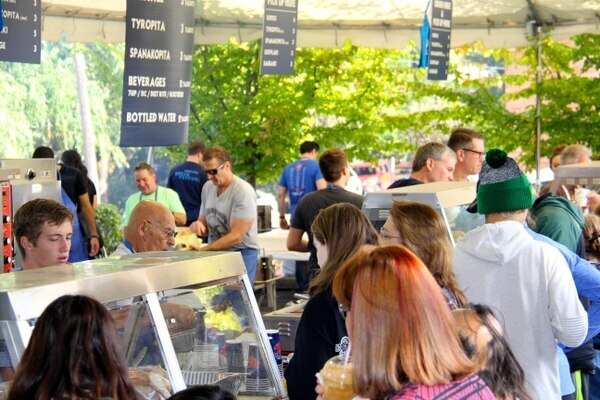 Members who have been involved with the Greek Festival for generations know how much it's evolved over time, and how much work goes into getting the event ready for Portlanders each year. It's a community affair that begins as early as May, and it starts with pastry making. 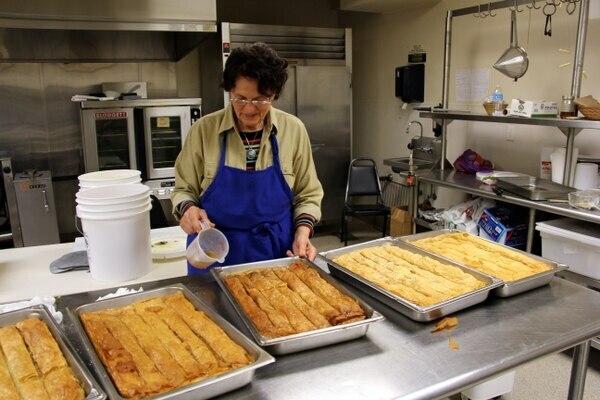 With 15 – 40 people involved in pastry prep on any given day, it's a testament to the commitment, organization, and most of all, collaboration, that makes the Greek Festival possible. "One thing that's really beautiful about pastry making is that our community comes together for one joint effort. People take time out of their lives to come and make tens of thousands of pastries… which can be hard work!" Joana Maletis notes. 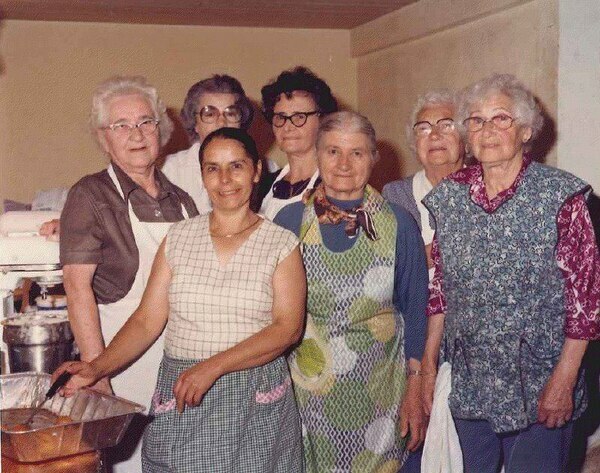 Joana's mother Eleni Marschman and grandmother Katy Vokos describe more memories about festival traditions, reflecting on the roles they've all played through the years – from pastries to dancing (and directing dancing) to office accounting work. "We try to inspire young people to come and learn from us, so that we're continually passing down the culture and the way we work together," Eleni shares. Once the food is ready, the dancers have rehearsed, and the weekend arrives, the best part of the Greek Festival is apparent: the fellowship. "It brings us all together, and it's our gift to the community," Chairperson Katherine Ossey says. What's not to miss this year? Make sure to include lamb roasted on a spit, a delicacy sure to have a line (it's worth it), Greek salads, and those sweet loukoumades on your short list of foods. See you October 5 – 7 at the Holy Trinity Greek Orthodox Cathedral! 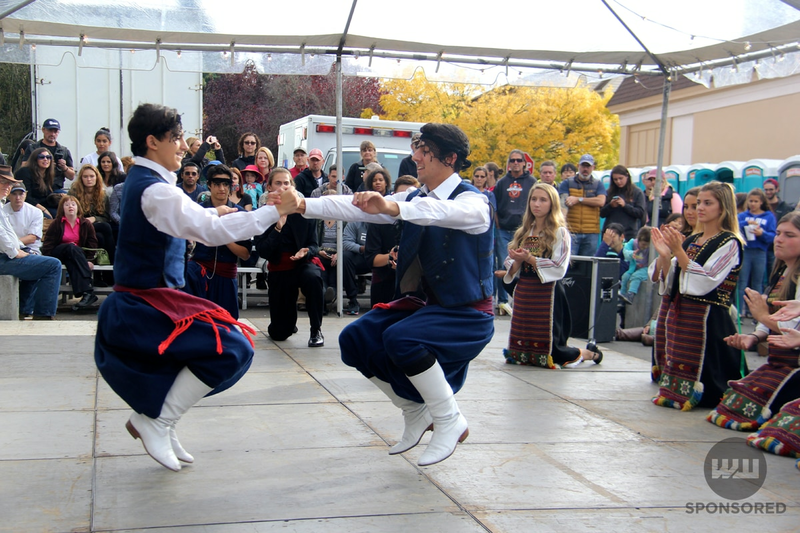 Go: Portland Greek Festival, Oct. 5-7. 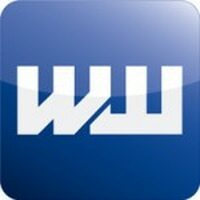 See portlandgreekfestival.com for more info.